NFEC Presentation Proposals are due December 2017! Louisiana Tech University has been selected to host the National Field Experience Conference on April 4 – 6, 2017. In the meantime, we would like to invite you to join us for the NFEC. 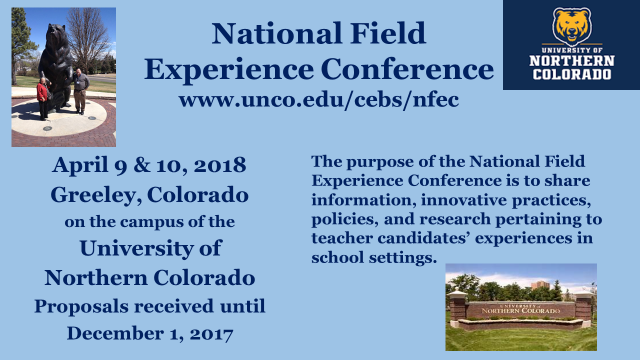 For more information on the NFEC, please visit their website at ​http://www.unco.edu/cebs/nfec/. The CRC at Louisiana Tech University is proud to host an annual conference offering professional development for clinical residency leaders, faculty and staff, mentor teachers, and students. It is an opportunity for everyone interested in the TEAM ​model of teacher preparation to come together, share experiences, and learn from one another. Our First Annual Clinical Residency Conference was held June 13, 2016 in University Hall on the Louisiana Tech University campus. We will be posting more information about our Second Annual Conference in the coming months. In the meantime, please browse our conference archive for videos, documents, and other resources.